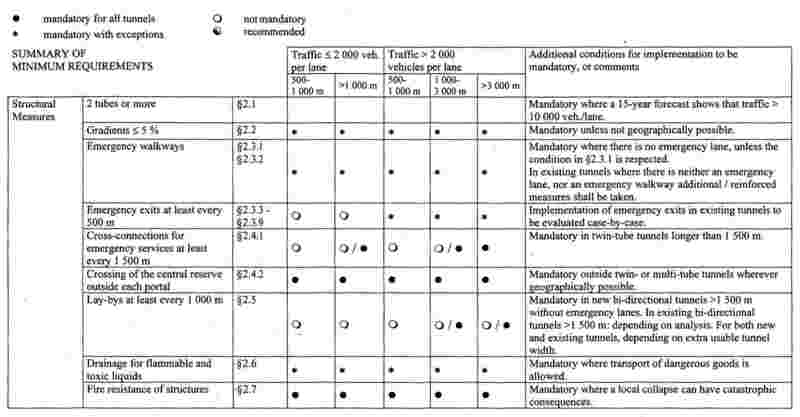 In its White Paper of 12 September 2001 on "European transport policy for 2010: time to decide" the Commission announced that it would propose minimum safety requirements for tunnels belonging to the Trans-European Road Network. The transport system, notably the Trans-European Road Network defined in Decision No 1692/96/EC of the European Parliament and of the Council of 23 July 1996 on Community guidelines for the development of the trans-European transport network (4), is of paramount importance in supporting European integration and ensuring a high level of well-being among Europe's citizens. The European Community has the responsibility of guaranteeing a high, uniform and constant level of security, service and comfort on the Trans-European Road Network. Long tunnels of over 500 m in length are important structures which facilitate communication between large areas of Europe and play a decisive role in the functioning and development of regional economies. The European Council has on several occasions, and notably at its meeting on 14 and 15 December 2001 in Laeken, underlined the urgency of taking measures to improve tunnel safety. On 30 November 2001, the Transport Ministers of Austria, France, Germany, Italy and Switzerland met in Zurich and adopted a Common Declaration recommending the alignment of national legislations on the most recent harmonised requirements for improving safety in long tunnels. Since the objective of the proposed action, namely the achievement of a uniform, constant and high level of protection for all European citizens in road tunnels, cannot be sufficiently achieved by the Member States and can therefore, by reason of the level of harmonisation required, be better achieved at Community level, the Community may adopt measures, in accordance with the principle of subsidiarity as set out in Article 5 of the Treaty. In accordance with the principle of proportionality, as set out in that Article, this Directive does not go beyond what is necessary in order to achieve that objective. Recent accidents in tunnels emphasise their importance in human, economic and cultural terms. Some tunnels in Europe, put into operation a long time ago, were designed at a time when technical possibilities and transport conditions were very different from those of today. There are thus disparate safety levels and this must be rectified. Safety in tunnels requires a number of measures relating, amongst other things, to the geometry of the tunnel and its design, safety equipment, including road signs, traffic management, training of the emergency services, incident management, the provision of information to users on how best to behave in tunnels, and better communication between the authorities in charge and emergency services such as the police, fire-brigades and rescue teams. As the work of the United Nations Economic Commission for Europe (UNECE) has already made clear, the conduct of road users is a decisive aspect of tunnel safety. Safety measures should enable people involved in incidents to rescue themselves, allow road users to act immediately so as to prevent more serious consequences, ensure that emergency services can act effectively and protect the environment as well as limit material damage. The improvements brought about by this Directive will improve safety conditions for all users, including disabled persons. However, as disabled persons have more difficulty in escaping in an emergency, particular consideration should be given to their safety. 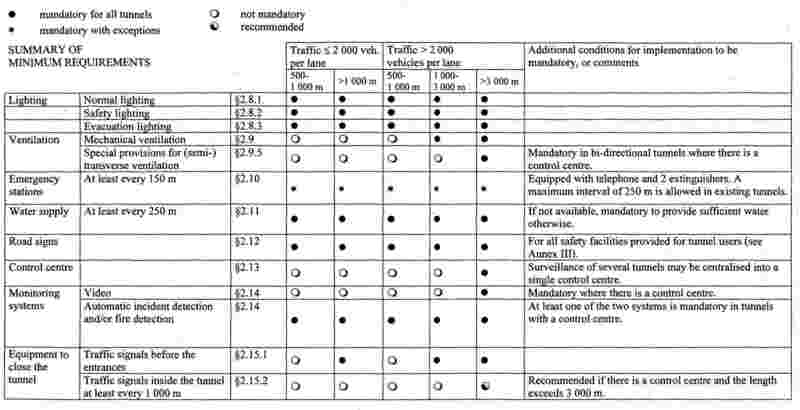 In order to implement a balanced approach and due to the high cost of the measures, minimum safety equipment should be defined taking into account the type and the expected traffic volume of each tunnel. International bodies such as the World Road Association and the UNECE have for a long time been making invaluable recommendations to help improve and harmonise safety equipment and traffic rules in road tunnels. However, as these recommendations are not binding, their full potential can only be maximised if the requirements they identify are made mandatory through legislation. Maintaining a high safety level requires proper maintenance of the safety facilities in tunnels. An exchange of information on modern safety techniques and accident/incident data between the Member States should be systematically organised. In order to ensure that the requirements of this Directive are properly applied by Tunnel Managers, Member States should designate one or more authorities at national, regional or local level with responsibility for ensuring that all aspects of tunnel safety are assured. A flexible and progressive timetable is needed for implementation of this Directive. This will allow for completion of the most urgent works without creating major disturbances in the transport system or bottlenecks in public works in the Member States. The cost of refurbishing existing tunnels varies considerably from one Member State to another, particularly for geographical reasons, and Member States should be allowed to stagger any refurbishment works needed to meet the requirements of this Directive where the density of tunnels on their territory is well in excess of the European average. For tunnels already in operation or tunnels whose design has been approved but which have not been opened to the public within 24 months following the entry into force of this Directive, Member States should be allowed to accept the adoption of risk reduction measures as an alternative to application of the requirements of the Directive, where the tunnel does not allow for structural solutions to be implemented at reasonable cost. Further technical progress is still necessary to improve tunnel safety. A procedure should be introduced to allow the Commission to adapt the requirements of this Directive to technical progress. That procedure should also be used to adopt a harmonised risk analysis method. Where the requirements of this Directive necessitate the construction of a second tube for a tunnel in the design or construction phase, this second tube to be constructed should be considered as a new tunnel. The same applies if the requirements of this Directive necessitate the opening of new legally binding planning procedures, including planning permission hearings for all related measures. Work should continue in the appropriate fora in order to arrive at a large degree of harmonisation as regards the signs and pictogrammes used on variable message signs in tunnels. Member States should be encouraged to harmonise the user interface for all tunnels on their territory. Member States should be encouraged to implement comparable safety levels for road tunnels located in their territory that do not form part of the Trans-European Road Network and consequently do not fall within the scope of this Directive. 1. This Directive aims at ensuring a minimum level of safety for road users in tunnels in the Trans-European Road Network by the prevention of critical events that may endanger human life, the environment and tunnel installations, as well as by the provision of protection in case of accidents. 2. It shall apply to all tunnels in the Trans-European Road Network with lengths of over 500 m, whether they are in operation, under construction or at the design stage. "Trans-European Road Network" means the road network identified in Section 2 of Annex I to Decision No 1692/96/EC and illustrated by maps and/or described in Annex II to that Decision. "Emergency services" means all local services, whether public or private or part of the tunnel staff, which intervene in the event of an accident, including police services, fire brigades and rescue teams. "Tunnel length" means the length of the longest traffic lane, measured on the fully enclosed part of the tunnel. 1. Member States shall ensure that tunnels in their territory, falling within the scope of this Directive meet the minimum safety requirements laid down in Annex I. 2. Where certain structural requirements laid down in Annex I can only be satisfied through technical solutions which either cannot be achieved or can be achieved only at disproportionate cost, the Administrative Authority as referred to in Article 4 may accept the implementation of risk reduction measures as an alternative to application of those requirements, provided that the alternative measures will result in equivalent or improved protection. The efficiency of these measures shall be demonstrated through a risk analysis in conformity with the provisions of Article 13. Member States shall inform the Commission of the risk reduction measures accepted as an alternative and provide justification therefor. This paragraph shall not apply to runnels at the design stage as referred to in Article 9. 3. Member States may specify stricter requirements, provided that they do not contravene the requirements of this Directive. 1. Member States shall designate (an) administrative authority(ies), hereinafter referred to as "the Administrative Authority", which shall have responsibility for ensuring that all aspects of the safety of a tunnel are assured and which shall take the necessary steps to ensure compliance with this Directive. 2. The Administrative Authority may be set up at national, regional or local level. 3. Each tunnel in the Trans-European Road Network located on the territory of a single Member State shall fall under the responsibility of a single Administrative Authority. For each tunnel located on the territory of two Member States, each Member State shall designate an Administrative Authority or, alternatively, the two Member States shall designate a joint Administrative Authority. If there are two different Administrative Authorities, the decisions of either taken in the exercise of its respective competencies and responsibilities with regard to tunnel safety shall be adopted with the prior agreement of the other Authority. 4. The Administrative Authority shall commission tunnels in accordance with the procedure laid down in Annex II. 5. Without prejudice to further arrangements on this subject at national level, the Administrative Authority shall have power to suspend or restrict the operation of a tunnel if safety requirements are not met. It shall specify the conditions under which normal traffic may be resumed. implementing the necessary risk reduction measures. 7. Where bodies designated as Administrative Authorities existed prior to the designation referred to in this Article, those Administrative Authorities may continue their previous activities provided that they comply with this Directive. 1. For each tunnel located on the territory of one Member State, whether it is in the design, construction or operating stage, the Administrative Authority shall identify as Tunnel Manager the public or private body responsible for the management of the tunnel at the stage in question. The Administrative Authority itself may perform this function. 2. For each tunnel located on the territory of two Member States, the two Administrative Authorities or the joint Administrative Authority shall recognise only one body in charge of the operation of the tunnel. 3. Any significant incident or accident occurring in a tunnel shall be the subject of an incident report prepared by the Tunnel Manager. This report shall be forwarded to the Safety Officer referred to in Article 6, to the Administrative Authority and to the emergency services within a maximum period of one month. 4. Where an investigation report is drawn up analysing the circumstances of the incident or accident referred to in paragraph 3 or the conclusions that can be drawn from it, the Tunnel Manager shall forward this report to the Safety Officer, the Administrative Authority and the emergency services no later than one month after he receives it himself. 1. For each tunnel, the Tunnel Manager shall, with the prior approval of the Administrative Authority, nominate one Safety Officer who shall coordinate all preventive and safeguards measures to ensure the safety of users and operational staff. The Safety Officer may be a member of the tunnel staff or the emergency services, shall be independent in all road tunnel safety issues and shall not be under instructions from an employer in respect of those issues. A Safety Officer may perform his tasks and functions at several tunnels in a region. take part in the evaluation of any significant incident or accident as referred to in Article 5(3) and (4). Member States shall ensure that inspections, evaluations and tests are carried out by Inspection Entities. The Administrative Authority may perform this function. Any entity performing the inspections, evaluations and tests must have a high level of competence and high quality procedures and must be functionally independent from the Tunnel Manager. The Member States shall notify the Commission of the name and address of the Administrative Authority by ... (6). In the event of a change in this information they shall notify the Commission thereof within three months. 1. Any runnel whose design has not been approved by the responsible authority by [...] (7) shall be subject to the requirements of this Directive. 2. The tunnel shall be commissioned in accordance with the procedure laid down in Annex II. 1. In the case of tunnels whose design has been approved but which have not been opened to public traffic by [...] (7), the Administrative Authority shall assess their compliance with the requirements of this Directive, with specific reference to the safety documentation provided for in Annex II. 2. Where the Administrative Authority finds that a tunnel does not comply with the provisions of this Directive, it shall notify the Tunnel Manager that appropriate measures must be taken to increase safety and shall inform the Safety Officer. 3. The tunnel shall then be commissioned in accordance with the procedure laid down in Annex II. 1. In the case of tunnels which are already open to public traffic by [...] (8), the Administrative Authority shall have until [...] (9) to assess their compliance with the requirements of this Directive, with specific reference to the safety documentation provided for in Annex II and on the basis of an inspection. 2. The Tunnel Manager shall, if necessary, propose to the Administrative Authority a plan for adapting the tunnel to the provisions of this Directive and the remedial measures he intends to put in place. 3. The Administrative Authority shall give its approval to the remedial measures or ask for them to be modified. 4. Thereafter, if the remedial measures include any substantial modification in the construction or operation, then once these measures have been taken, the procedure laid down in Annex II shall be implemented. 5. Member States shall by (10) submit a report to the Commission on how they plan to meet the requirements of this Directive, on planned measures, and, where appropriate, on the consequences of opening or closing the main access roads to the tunnels. In order to minimise disturbances to traffic at European level, the Commission may comment on the timetable of the work intended to ensure that tunnels comply with the requirements of this Directive. 6. The refurbishment of tunnels shall be carried out according to a schedule and shall be finished by [...] (11). 7. Where the total tube length of existing tunnels divided by the total length of the part of the Trans-European Road Network located on their territory exceeds the European average, Members States may extend the period stipulated in paragraph 6 by five years. 1. The Administrative Authority shall verify that regular inspections are carried out by the Inspection Entity to ensure that all tunnels falling within the scope of this Directive comply with its provisions. 2. The period between two consecutive inspections of any given tunnel shall not exceed six years. 3. Where, on the basis of the report of the Inspection Entity, the Administrative Authority finds that a tunnel does not comply with the provisions of this Directive, it shall notify the Tunnel Manager and the Safety Officer that measures to increase tunnel safety must be adopted. The Administrative Authority shall define the conditions for continuing to operate the tunnel or for re-opening the tunnel which will apply until the remedial measures and any further relevant restrictions or conditions are implemented. 4. If the remedial measures include any substantial modification in the tunnel's construction or operation, then once these measures have been taken, the tunnel shall be made the subject of a new authorisation to operate in accordance with the procedure laid down in Annex II. 1. Risk analyses, where necessary, shall be carried out by a body which is functionally independent from the Tunnel Manager. The content and the results of the risk analysis shall be included in the safety documentation submitted to the Administrative Authority. A risk analysis is an analysis of risks for a given tunnel, taking into account all design factors and traffic conditions that affect safety, notably traffic characteristics and type, tunnel length and tunnel geometry, as well as the forecast number of heavy goods vehicles per day. 2. Member States shall ensure that, at national level, a detailed and well-defined methodology, corresponding to the best available practices, is used and shall inform the Commission of the methodology applied; the Commission shall make this information available in electronic form to other Member States. 3. By [...] (12) the Commission shall publish a report on the practice followed in the Members States. Where necessary, it shall make proposals for the adoption of a common harmonised risk analysis methodology in accordance with the procedure referred to in Article 17(2). 1. In order to allow the installation and use of innovative safety equipment or the use of innovative safety procedures which provide an equivalent or higher level of protection than current technologies, as prescribed in this Directive, the Administrative Authority may grant a derogation from the requirements of the Directive on the basis of a duly documented request from the Tunnel Manager. 2. If the Administrative Authority intends to grant such a derogation, the Member State shall first submit a derogation application to the Commission containing the initial request and the opinion of the Inspection Entity. 3. The Commission shall notify the application to the Member States within one month of receipt. 4. If, within a period of three months, neither the Commission nor a Member State formulates objections, the derogation shall be treated as granted and the Commission shall inform all Member States accordingly. 5. If objections are expressed, the Commission shall make a proposal in accordance with the procedure referred to in Article 17(2). Where the decision is negative, the Administrative Authority shall not grant the derogation. 6. After an examination in accordance with the procedure referred to in Article 17(2), a decision to grant a derogation may allow this derogation to be applied to other tunnels. 7. Whenever justified by the derogation requests submitted to it, the Commission shall publish a report on the practice followed in the Member States and, if necessary, make proposals for amendment of this Directive. 1. Every two years, Member States shall compile reports on fires in tunnels and on accidents which clearly affect the safety of road users in tunnels, and on the frequency and causes of such incidents, and shall evaluate them and provide information on the actual role and effectiveness of safety facilities and measures. These reports shall be transmitted to the Commission by the Member States before the end of September of the year following the reporting period. The Commission shall make the reports available to all Member States. 2. Member States shall make a plan which includes a timetable for the gradual application of the provisions of this Directive to tunnels already in operation as described in Article 11 and notify it by [...] (13) to the Commission. Thereafter, Member States shall inform the Commission every two years of the state of implementation of the plan and of any changes made to it, until the end of the period referred to in Article 11(6) and (7). The Commission shall adapt the Annexes to this Directive to technical progress, in accordance with the procedure referred to in Article 17(2). 1. Member States shall bring into force the laws, regulations and administrative provisions necessary to comply with this Directive by [...] (14). They shall immediately forward to the Commission the text of those provisions, together with a table correlating those provisions with this Directive. 2. The provisions adopted by the Member States shall contain a reference to this Directive or be accompanied by such a reference on the occasion of their official publication. Member States shall determine how such reference is to be made. This Directive shall enter into force on the date of its publication in the Official Journal of the European Union. (1) OJ C 220, 16.9.2003, p. 26. (2) OJ C 256, 24.10.2003, p. 64. (3) Opinion of the European Parliament of 9 October 2003 (not yet published in the Official Journal), Council Common Position of 26 February 2004 (OJ C 95 E, 20.4.2004, p. 31) and Position of the European Parliament of 20 April 2004 (not yet published in the Official Journal). (4) OJ L 228 of 9.9.1996, p. 1. Decision as amended by Decision No 1346/2001/EC (OJ L 185, 6.7.2001, p. 1). (6) 24 months after the date of entry into force of this Directive. (7) 24 months after the date of entry into force of this Directive. (8) 24 months after the date of entry into force of this Directive. (9) 30 months after the date of entry into force of this Directive. (10) 36 months after the date of entry into force of this Directive. (11) 10 years after the date of entry into force of this Directive. (12) Five years after the date of entry into force of this Directive. (13) 30 months after the date of entry into force of this Directive. (14) 24 months after the date of entry into force of this Directive. Safety measures to be implemented in a tunnel shall be based on a systematic consideration of all aspects of the system composed of the infrastructure, operation, users and vehicles. Where a tunnel has a special characteristic as regards the aforementioned parameters, a risk analysis shall be carried out in accordance with Article 13 to establish whether additional safety measures and/or supplementary equipment is necessary to ensure a high level of tunnel safety. This risk analysis shall take into consideration possible accidents, which clearly affect the safety of road users in tunnels and which might occur during the operating stage and the nature and magnitude of their possible consequences. the alternative risk reduction measures which are to be used or reinforced in order to ensure at least an equivalent level of safety, including proof therefor in the form of an analysis of relevant risks. The Commission shall transmit any request for a limited derogation to the Member States as soon as possible, and in any case within one month of receipt. If, within a period of three months after receipt of the request by the Commission, neither the Commission nor a Member State formulates objections, the limited derogation shall be deemed granted and the Commission shall inform all Member States accordingly. If objections are expressed, the Commission shall make a proposal in accordance with the procedure referred to in Article 17(2). Where the decision is negative, the limited derogation shall not be allowed. In order to provide a unified interface in all tunnels to which this Directive applies, no derogation from the requirements of the following paragraphs shall be allowed regarding the design of the safety facilities at the disposal of the tunnel users (emergency stations, signs, lay-bys, emergency exits, radio re-broadcasting when required). Where "traffic volume" is mentioned in this Annex, it refers to the annual average daily traffic through a tunnel per lane. For the purpose of determining the traffic volume, each motor vehicle shall be counted as one unit. Where the number of heavy goods vehicles over 3,5 t exceeds 15% of the annual average daily traffic, or seasonal daily traffic significantly exceeds the annual average daily traffic, the additional risk will be assessed and taken into account by increasing the traffic volume of the tunnel for the application of the following paragraphs. The main criteria for deciding whether to build a single or a twin-tube tunnel shall be projected traffic volume and safety, taking into account aspects such as the percentage of heavy goods vehicles, gradient and length. In any case, where, for tunnels at the design stage, a 15-year forecast shows that the traffic volume will exceed 10 000 vehicles per day per lane, a twin-tube tunnel with unidirectional traffic shall be in place at the time when this value will be exceeded. With the exception of the emergency lane, the same number of lanes shall be maintained inside and outside the tunnel. Any change in the number of lanes shall occur at a sufficient distance in front of the tunnel portal; this distance shall be at least the distance covered in 10 seconds by a vehicle travelling at the speed limit. When geographic circumstances prevent this, additional and/or reinforced measures shall be taken to enhance safety. Special consideration shall be given to safety when designing the cross-sectional geometry and the horizontal and vertical alignment of a tunnel and its access roads, as these parameters have a significant influence on the probability and severity of accidents. Longitudinal gradients above 5% shall not be permitted in new tunnels, unless no other solution is geographically possible. In tunnels with gradients higher than 3%, additional and/or reinforced measures shall be taken to enhance safety on the basis of a risk analysis. Where the width of the slow lane is less than 3,5 m and heavy goods vehicles are allowed, additional and/or reinforced measures shall be taken to enhance safety, on the basis of a risk analysis. In new tunnels without an emergency lane, emergency walkways, elevated or not, shall be provided for use by tunnel users in the event of a breakdown or an accident. This provision does not apply if the construction characteristics of the tunnel do not allow it or allow it only at disproportional cost and the tunnel is unidirectional and is equipped with a permanent surveillance and lane closure system. In existing tunnels where there is neither an emergency lane nor an emergency walkway, additional and/or reinforced measures shall be taken to ensure safety. shelters with an escape route separate from the tunnel tube. Shelters without an exit leading to escape routes to the open shall not be built. Emergency exits shall be provided if an analysis of relevant risks, including how far and how quickly smoke travels under local conditions, shows that the ventilation and other safety provisions are insufficient to ensure the safety of road users. In any event, in new tunnels, emergency exits shall be provided where the traffic volume is higher than 2 000 vehicles per lane. In existing tunnels longer than 1 000 m, with a traffic volume higher than 2 000 vehicles per lane, the feasibility and effectiveness of the implementation of new emergency exits shall be evaluated. Where emergency exits are provided, the distance between two emergency exits shall not exceed 500 m.
Appropriate means, such as doors, shall be used to prevent smoke and heat from reaching the escape routes behind the emergency exit, so that the runnel users can safely reach the outside and the emergency services can have access to the tunnel. In twin-tube tunnels where the tubes are at the same level or nearly, cross-connections suitable for the use of emergency services shall be provided at least every 1 500 m.
Wherever geographically possible, crossing of the central reserve (median strip) shall be made possible outside each portal of a twin- or multi-tube tunnel. This measure will allow emergency services to gain immediate access to either tube. For new bi-directional tunnels longer than 1 500 m where traffic volume is higher than 2 000 vehicles per lane, lay-bys shall be provided at distances which do not exceed 1 000 m, if emergency lanes are not provided. In existing bi-directional tunnels longer than 1 500 m with a traffic volume higher than 2 000 vehicles per lane but no emergency lane, the feasibility and effectiveness of the implementation of lay-bys shall be evaluated. If the construction characteristics of the tunnel do not allow it or allow it only at disproportionate cost, lay-bys do not have to be provided if the total tunnel width which is accessible to vehicles, excluding elevated parts and normal traffic lanes, is at least equal to the width of one normal traffic lane. Lay-bys shall include an emergency station. Where the transport of dangerous goods is permitted, the drainage of flammable and toxic liquids shall be provided for through well-designed slot gutters or other measures within the tunnel cross sections. Additionally, the drainage system shall be designed and maintained to prevent fire and flammable and toxic liquids from spreading inside tubes and between tubes. If in existing tunnels that requirement cannot be met or can be met only at disproportionate cost, this shall be taken into consideration when deciding whether to allow the transport of dangerous goods on the basis of an analysis of relevant risks. The main structure of all tunnels where a local collapse of the structure could have catastrophic consequences, e.g. immersed tunnels or tunnels which can cause the collapse of important neighbouring structures, shall ensure a sufficient level of fire resistance. Normal lighting shall be provided so as to ensure appropriate visibility day and night for drivers in the entrance zone as well as in the interior of the tunnel. Safety lighting shall be provided to allow a minimum visibility for tunnel users to evacuate the tunnel in their vehicles in the event of a breakdown of the power supply. Evacuation lighting, such as evacuation marker lights, at a height of no more than 1,5 m, shall be provided to guide tunnel users to evacuate the tunnel on foot, in the event of emergency. the control of heat and smoke in the event of a fire. A mechanical ventilation system shall be installed in all tunnels longer than 1 000 m with a traffic volume higher than 2 000 vehicles per lane. In tunnels with bi-directional and/or congested unidirectional traffic, longitudinal ventilation shall be allowed only if a risk analysis according to Article 13 shows it is acceptable and/or specific measures are taken, such as appropriate traffic management, shorter emergency exit distances, smoke exhausts at intervals. Transverse or semi-transverse ventilation systems shall be used in tunnels where a mechanical ventilation system is necessary and longitudinal ventilation is not allowed under point 2.9.3. These systems must be capable of evacuating smoke in the event of a fire. the longitudinal air velocity shall be monitored constantly and the steering process of the ventilation system (dampers, fans, etc.) adjusted accordingly. Emergency stations are intended to provide various items of safety equipment, in particular emergency telephones and extinguishers, but are not intended to protect road users from the effects of fire. Emergency stations can consist of a box on the sidewall or preferably a recess in the sidewall. They shall be equipped with at least an emergency telephone and two fire extinguishers. Emergency stations shall be provided near the portals and inside at intervals which for new tunnels shall not exceed 150 m and which in existing tunnels shall not exceed 250 m.
A water supply shall be provided for all tunnels. Hydrants shall be provided near the portals and inside at intervals which shall not exceed 250 m. If a water supply is not available, it is mandatory to verify that sufficient water is provided otherwise. Specific signs shall be used for all safety facilities provided for tunnel users. Signs and panels for use in tunnels are given in Annex III. A control centre shall be provided for all tunnels longer than 3 000 m with a traffic volume higher than 2 000 vehicles per lane. Surveillance of several tunnels may be centralised at a single control centre. Video monitoring systems and a system able to automatically detect traffic incidents (such as stopping vehicles) and/or fires shall be installed in all runnels with a control centre. Automatic fire detection systems shall be installed in all tunnels which do not have a control centre where the operation of mechanical ventilation for smoke control is different from the automatic operation of ventilation for the control of pollutants. In all tunnels longer than 1 000 m, traffic signals shall be installed before the entrances so that the tunnel can be closed in case of an emergency. Additional means, such as variable message signs and barriers, can be provided to ensure that instructions are obeyed. Inside all tunnels longer than 3 000 m, with a control centre and a traffic volume higher than 2 000 vehicles per lane, equipment to stop vehicles in the event of an emergency is recommended at intervals not exceeding 1 000 m. This equipment shall consist of traffic signals and possibly additional means, such as loudspeakers, variable message signs and barriers. Radio re-broadcasting equipment for emergency service use shall be installed in all tunnels longer than 1 000 m with a traffic volume higher than 2 000 vehicles per lane. Where there is a control centre, it must be possible to interrupt radio re-broadcasting of channels intended for tunnel users, if available, in order to give emergency messages. Shelters and other facilities where evacuating tunnel users must wait before they can reach the outside shall be equipped with loudspeakers for the provision of information to users. All tunnels shall have an emergency power supply capable of ensuring the operation of safety equipment indispensable for evacuation until all users have evacuated the tunnel. Electrical, measurement and control circuits shall be designed in such a way that a local failure, such as one due to a fire, does not affect unimpaired circuits. The level of fire resistance of all tunnel equipment shall take into account the technological possibilities and aim at maintaining the necessary safety functions in the event of a fire. The table set out hereafter gives a summary of the minimum requirements laid down in the previous paragraphs. The minimum requirements are those set out in the operative text of this Annex. Tunnel operation shall be organised and dispose of such means as will ensure the continuity and safety of the traffic through the tunnel. The personnel involved in the operation as well as the emergency services shall receive appropriate initial and continuing training. Emergency response plans shall be available for all tunnels. In tunnels starting and finishing in different Member States, a single bi-national emergency response plan shall involve the two countries. Complete or partial closure of lanes due to construction or maintenance works planned in advance shall always begin outside the tunnel. Variable message signs, traffic signals and mechanical barriers may be used for this purpose. In the event of a serious accident or incident, all appropriate tunnel tubes shall be closed immediately to traffic. This shall be done by simultaneous activation not only of the abovementioned equipment before the portals, but also of variable message signs, traffic signals and mechanical barriers inside the tunnel, if available, so that all the traffic can be stopped as soon as possible outside and inside the tunnel. Tunnels of less than 1 000 m may be closed by other means. Traffic shall be managed in such a way that unaffected vehicles can quickly leave the tunnel. The access time for emergency services in the event of an incident in a tunnel shall be as short as possible and shall be measured during periodic exercises. In addition, it may be measured during incidents. In major bi-directional tunnels with high traffic volumes, a risk analysis in accordance with Article 13 shall establish whether emergency services shall be stationed at the two extremities of the tunnel. For all tunnels requiring a control centre, including those starting and finishing in different Member States, a single control centre shall have full control at any given time. In the event of tunnel closure (long or short-term), users shall be informed of the best alternative itineraries, by means of easily accessible information systems. Such alternative itineraries shall form part of systematic contingency plans. They should aim to maintain traffic flow as much as possible and minimise secondary safety effects on the surrounding areas. Member States should make all reasonable efforts to avoid a situation in which a tunnel located on the territory of two Member States can not be used due to the consequences of bad weather conditions. consider specific operating measures designed to reduce the risks related to some or all of the vehicles transporting dangerous goods in tunnels, such as declaration before entering or passage in convoys escorted by accompanying vehicles, on a case by case basis further to the aforementioned risk analysis. A risk analysis shall be carried out in order to decide whether heavy goods vehicles should be allowed to overtake in tunnels with more than one lane in each direction. The appropriate speed of vehicles and the safe distance between them are especially important in tunnels and shall be given close attention. This shall include advising tunnel users of appropriate speeds and distances. Enforcement measures shall be initiated as appropriate. Road users driving passenger cars should under normal conditions maintain a minimum distance from the vehicle in front of them equivalent to the distance travelled by a vehicle in 2 seconds. For heavy goods vehicles this distance should be doubled. When traffic stops in a tunnel, road users should maintain a minimum distance of 5 metres from the vehicle in front, except if this is not possible due to an emergency stop. Information campaigns regarding safety in tunnels shall be regularly organised and implemented in conjunction with interested parties on the basis of the harmonised work of international organisations. These information campaigns shall cover the correct behaviour of road users when approaching and driving through tunnels, especially in connection with vehicle breakdown, congestion, accidents and fires. Information on the safety equipment available and proper road user behaviour in tunnels shall be provided in convenient places for tunnel users (for example at rest areas before tunnels, at tunnel entrances when the traffic is stopped or on the internet). The provisions of this Directive shall be applied from the preliminary design stage onward. Before any construction work begins, the Tunnel Manager shall compile the safety documentation described under points 2.2 and 2.3 for a tunnel at the design stage and shall consult the Safety Officer. The Tunnel Manager shall submit the safety documentation to the Administrative Authority and attach the opinion of the Safety Officer, and/or of the Inspection Entity when available. The design, as appropriate, shall be approved by the responsible authority, which shall inform the Tunnel Manager and the Administrative Authority of its decision. The Tunnel Manager shall compile safety documentation for each tunnel and keep it permanently up-to-date. He shall provide a copy of the safety documentation to the Safety Officer. The safety documentation shall describe the preventive and safeguard measures needed to ensure the safety of users, taking into account people with reduced mobility and disabled people, the nature of the route, the configuration of the structure, its surroundings, the nature of the traffic and the scope for action by the emergency services defined in Article 2 of the Directive. an opinion on safety from an expert or organisation specialising in this field, which could be the Inspection Entity. a description of the system of permanent feedback of experience through which significant incidents and accidents can be recorded and analysed. a list of the safety exercises carried out and an analysis of the lessons learned from them. The initial opening of a tunnel to public traffic shall be subject to authorisation by the Administrative Authority (commissioning) in accordance with the following procedure. This procedure also applies to the opening of a tunnel to public traffic after any major change in construction or operation or any substantial modification work on the tunnel which might significantly alter any of the constituent components of the safety documentation. The Tunnel Manager shall transmit the safety documentation mentioned in point 2.4 to the Safety Officer, who shall give his opinion on the opening of the runnel to public traffic. The Tunnel Manager shall forward this safety documentation to the Administrative Authority, and shall attach the opinion of the Safety Officer. The Administrative Authority shall decide whether or not to authorise the opening of the tunnel to public traffic, or whether to do so with restrictive conditions, and shall notify this to the Tunnel Manager. A copy of this decision shall be forwarded to the emergency services. For any substantial modification in the structure, equipment or operation, which might significantly alter any of the constituent components of the safety documentation, the Tunnel Manager shall ask for a new authorisation of operation following the procedure described under point 3). The Tunnel Manager shall inform the Safety Officer of any other change in construction and operation. Furthermore, prior to any modification work on the tunnel, the Tunnel Manager shall provide the Safety Officer with documentation detailing the proposals. The Safety Officer shall examine the consequences of the modification and in any event give his opinion to the Tunnel Manager, who shall send a copy to the Administrative Authority and to the emergency services. The Tunnel Manager and the emergency services shall, in cooperation with the Safety Officer, organise joint periodic exercises for tunnel staff and the emergency services. may also, in part, be conducted as table top or computer simulation exercises for complementary results. Full scale exercises under conditions that are as realistic as possible shall be conducted in each tunnel at least every four years. Tunnel closure will only be required if acceptable arrangements can be made for diverting traffic. Partial and/or simulation exercises shall be conducted every year in between. In areas where several tunnels are located in close proximity to each other, a full scale exercise must be conducted in at least one of those tunnels. The Safety Officer and the emergency services shall evaluate jointly these exercises draw up a report and make appropriate proposals. 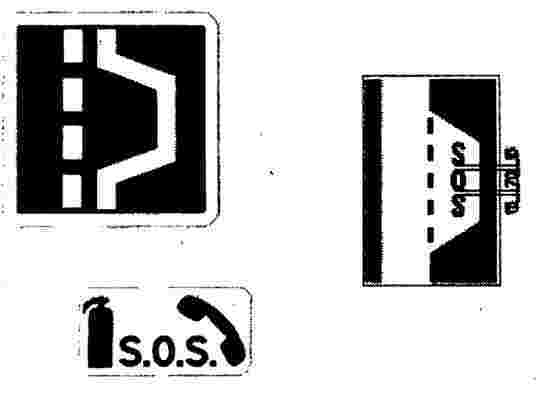 The following are road signs and symbols to be used for tunnels. Road signs mentioned in this section are described in the Vienna Convention on Road Signs and Signals of 1968, unless otherwise specified. In order to facilitate international understanding of signs, the system of signs and signals prescribed in this Annex is based on the use of shapes and colours characteristic of each class of sign and, wherever possible, on the use of graphic symbols rather than words. Where Member States consider it necessary to modify the signs and symbols prescribed, the modifications made shall not alter their essential characteristics. Where Member States do not apply the Vienna Convention, the prescribed signs and symbols may be modified, provided that the modifications made shall not alter their essential intent. Emergency stations: signs to indicate the presence of emergency phones and fire extinguishers. In tunnels where users can receive information via their radio, appropriate signs placed before the entrance shall inform users on how to receive this information. Signs and markings shall be designed and positioned so that they are clearly visible. Member States shall use appropriate signs, if necessary, in the advance warning area of the tunnel, inside the runnel and after the end of the tunnel. When designing the signs for a tunnel, local traffic and construction conditions as well as other local conditions shall be considered. Signs according to the Vienna Convention on Road Signs and Signals shall be used, except in Member States which do not apply the Vienna Convention. The length shall be included either in the lower part of the panel or on a additional panel H2. 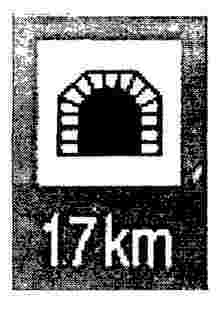 For tunnels over 3 000 m, the remaining length of the tunnel shall be indicated every 1 000 m.
The name of the tunnel may also be indicated. Horizontal delineation should be used at the roadside edge. In the case of bi-directional runnels, clearly visible means should be used along the median line (single or twin) separating the two directions. Follow signs to emergency exits"
The signs to indicate lay-bys should be E signs according to the Vienna Convention. Telephones and fire extinguishers shall be indicated by an additional panel or incorporated in the sign itself. It is also necessary to sign the two nearest exits on the sidewalls. Examples are shown below. Any variable message signs shall have clear indications to inform tunnel users of congestion, breakdown, accident, fire or any other hazards.